Leslie’s husband Tim built these kitchen cabinets — woah! 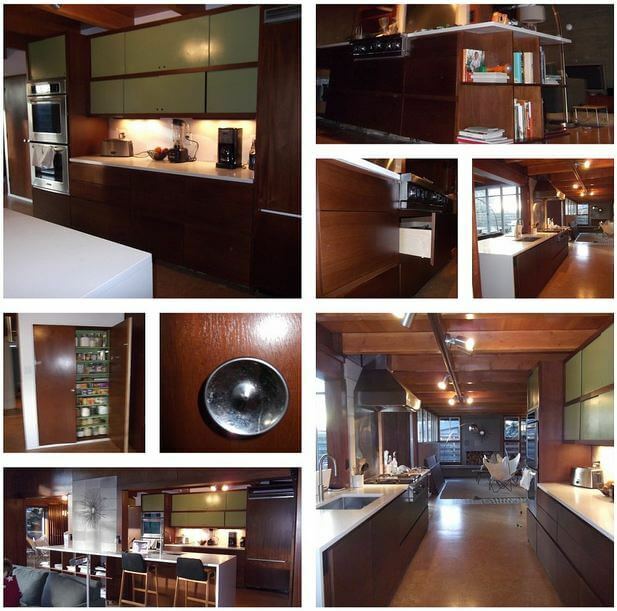 Read about their home and renovations on their blog, Mid Mod Redo. 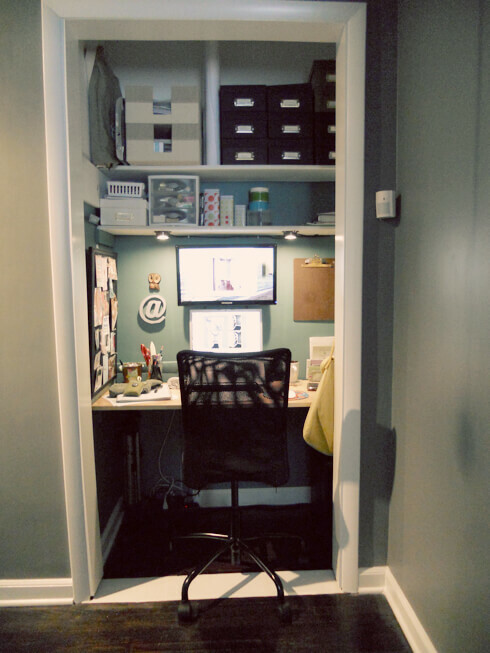 Martina is very handy — she built this little office in a hall closet. I am always fascinated by folks who can actually get these projects done. For more photos and info, check out her blog, My Mid-Century Modern Life. Misadvadventures: Liz the Adventuress explains how they forgot to plan for the swinging door when installing new ceramic tile. The tile was too thick… so the door scraped against it and couldn’t open inward. Oopsy! There was a happy ending, though — find out on her blog, Split Level Adventures. Sad news… with some sweetness, too: Cara’s grandfather died, and she and her father were working together at the house. 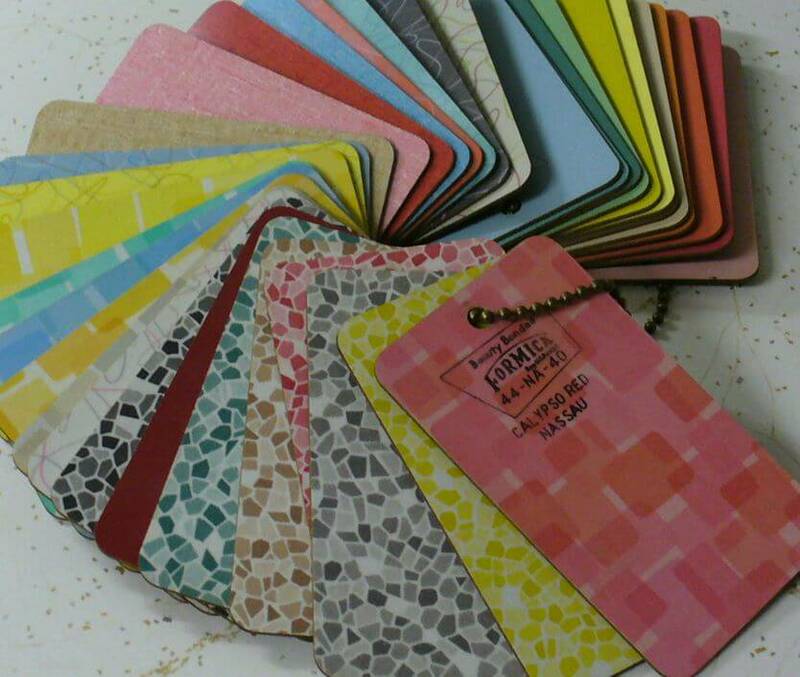 Her Dad found these vintage Formica samples tucked away, and knew that Cara would treasure them. Cara, I’m so sorry to hear about your grandfather. What a lovely memory to have of your grandparents’ place. It’s interesting: Whenever I get interviewed by reporters, they always ask why midcentury homes continue to grow in popularity. One of the reasons for sure: We have such fond memories of our grandparents’ homes, which often are of this vintage. Read Cara’s wonderful story of the discovery on her blog, Our Arts & Crafts Home. John and Diane have posted a catalog of the Paul McCobb Planner Group. 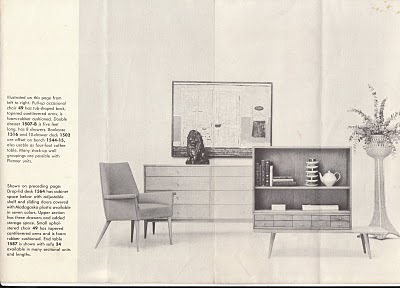 Parents owned a lot of this furniture, and had saved the brochure all these years. Jump over to their blog, Rancho Tostado, where the photos are scanned in big enough to enlarge and study. Amanda and her DH are renovating a 1958 ranch home in Texas. What I grasp from this post is that they tried to stain their concrete floor, and it was a disaster. 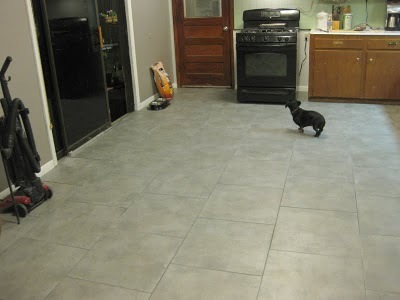 So instead, they found these tiles that have a stained concrete look, at an awesome price, and installed them. 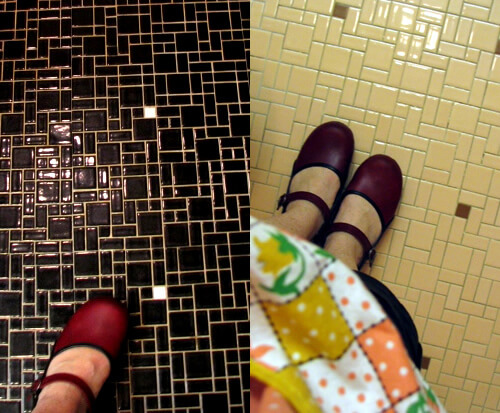 I think that in warm climate, in particular, tiled floors can be great. See more at Amanda’s blog, Eastridge Redux. Mr. Modtomic reports that he waited 11.5 hours to snag and hold his first-in-line place at an estate sale. You read that correctly: 11.5 hours. See his haul here. And, he cites a post by me as encouraging him to load up a boatload of photos from various estate sales in recent month — woah, this is a fun one!. Mr. M, your dedication to the cause is impressive indeed. Way to keep workin’ it, Retro Renovators! her apron is a retro fabric, too…reminds me of the wallpaper and matching fabric my mother bought for the kitchen in mid 70s. that kitchen had white wood grain laminate cabinets, yellow laminate counters, harvest gold appliances, and yellow linoleum tile flooring. Hey!! That swatch right on the top of the Formica swatches– The one that says “Calypso Red– Nassau”– that’s our kitchen countertop pattern, original to our 1957 mid mod! Only ours is in shades of yellow and mustard! How exciting! Now I know what it’s called! I think I spot our exact countertop material about 10 swatches in. Unfortunately, the kitchen has been “updated” with a separate cook top and wall oven (used to be a freestanding range in there per blueprints) some time in the 90s, and this update means that the already very snug kitchen has 2 patches of usable countertop space, each approximately 2 linear 2 feet each, so the kitchen will have to be redone to meet the demands of a family of 5 with a mom who cooks daily (usually more than once). So the very cool vintage Formica will be lost. We already have 2 rolls of aqua boomerang in the garage ready to go for the remodel (thnaks for the heads-up on that one!). Thanks for all of the amazingly cool stuff you share with us, Pam! be sure to see my comment in my Big Box from Big Box Store post – relaying Formica’s instructions how to store your new stash so it doesn’t go brittle. Oh, thanks Pam! I’ll take a look at that. “Calypso Red-Nassau” is in my kitchen now & I HATE it. I came across this page looking for ways to cover it. It is so ugly…and PINK. Ugh. WOW. 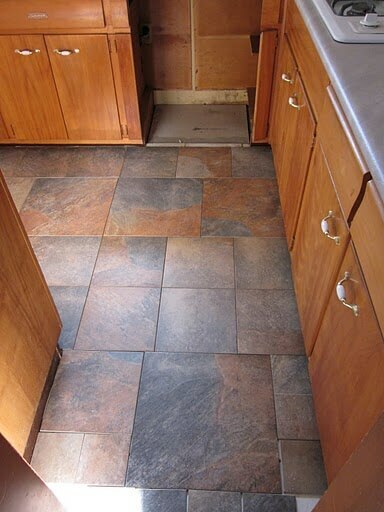 About 99% of the readers of this blog, I’d guess, would LOVE to have that laminate in their kitchen! Just looked at her blog and found it– It’s the Nassau in Sunshine Yellow. How cool to find out what it is called! those color chips are wonderful just to look at! I’d hang them on a hook by my desk. well, I just spent hours checking out Mr.ModTomic’s blog…..wow! and thanks. I’ve done me some learning.